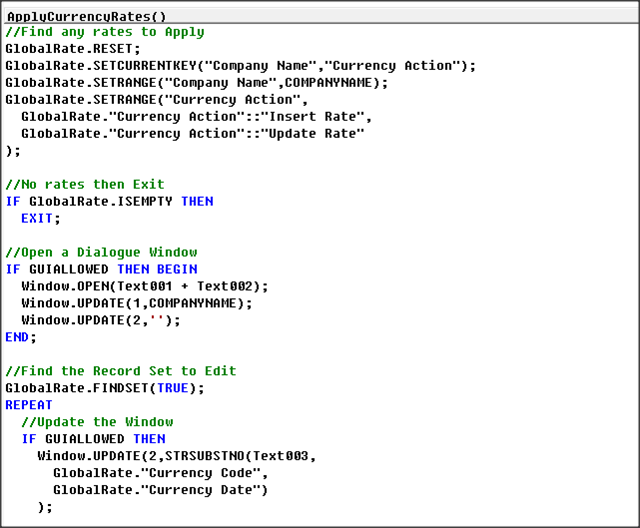 This post is the Second in a Series on Microsoft Dynamics 2013R2 Development, Part One Covered the Three Modules I will be Posting over the Coming Weeks, this Post is the “Code Behind” a Basic Currency Dashboard Shown in Part One the Objects in Text Format can be Downloaded at the Foot of this Post. The basic solution can be run in each Company, as a new Currency Dashboard, the Dashboard has the following Functions, Get Currencies, Get Currency Exchange Rates from System and Insert or Update the Currency Exchange Rate table, this Post Shows the Objects I used and the Code Behind the Solution, in Developing and Planning the Solution Consideration was Given to Module Two and Module Three. This Table has a Primary Key of Company Name and Currency Code the use of the Company Name Field will become more apparent in Module 2, the LCY code is Populated from the G/L Setup and the Type is Set from the Values, I set the Decimals on the Decimal Fields to 0:0, only the two Decimal Fields will be Editable. One Function was Created to Update the Type Field rather than writing the code in each Decimal Field or Other Triggers. The Code in the On Insert and On Modify Triggers Defaults the “Exchange Rate Amt.” if Required, here I used the Round Date Time to Round to the Nearest Minute for Display Reasons. Only the “Exchange Rate Amount or the “Relational Exch. Rate Amt.” can have a Value not Both, these are used in the Calculation to Default a Rate and Set the Type Value, if either Field has a New Value the Other Field is Cleared, this is better than Error Messages, Only a User that Deals with the Currencies should be editing these Values. The Function was Initially designed to use the MOD function, setting the Decimal Places on the Field overrides this code, but I left the Code in case the Decimal Places Property was Changed, an End User’s Licence might allow the User to edit the Properties but not the Code, the Function Sets the Type based on the Decimal Values. 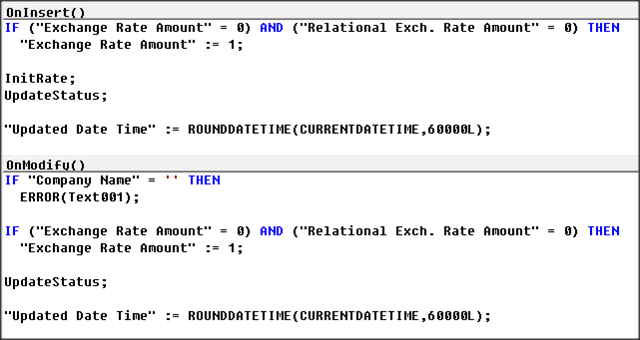 When Populated the Inverse Rate (UGS) or Normal Rate (USD) Value is set, the Last Updated Date Time shows the Result of the Round Date Time Call. 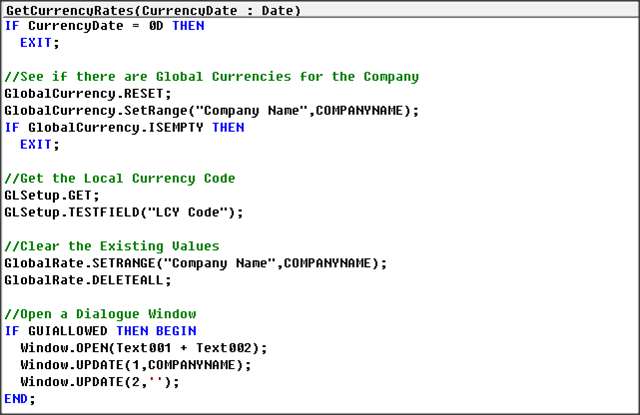 This Table has a Primary Key of Company Name, Currency Code and Currency Date, the use of the Company Name Field will become more apparent in Module 2, the LCY code is Populated from the G/L Setup and the Type is Set from the Values, this Table is Updated in Functional Code and Holds Type Information from the Existing Currency Exchange Rate Table. 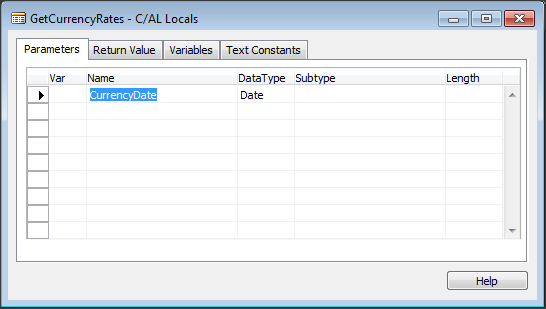 These Three functions are used in the Field Validation to Update Record Values. 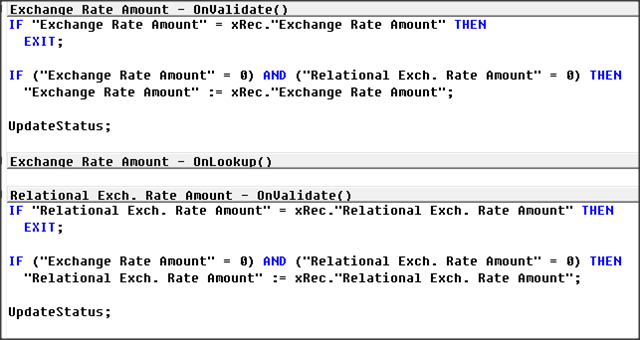 Both the “Exchange Rate Amount” and the “Relational Exch. Rate Amt.” can have a Value, these are used in the Calculation to Calculate the Currency Factor and Set the Type Value. 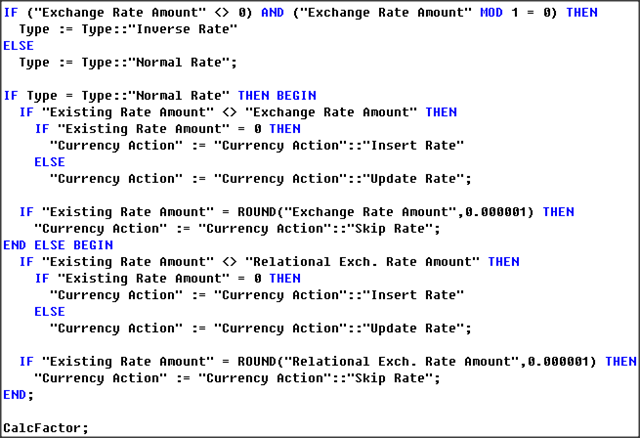 On Insert this Function is Called to Find the Last Currency Exchange Rate within a Date Filter, if a Rate is Found then the “Existing Rate Amount” and “Existing Rate Date” are Populated along with the Currency Description. 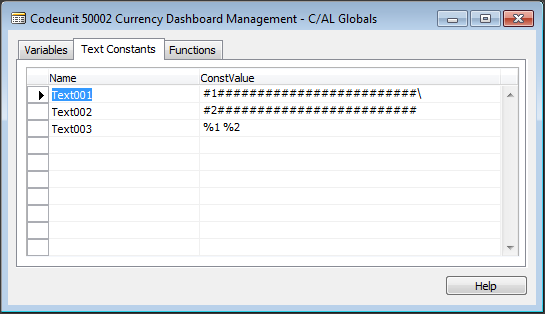 A Currency factor based on the Type is Calculated to be used in Calculations. The first part of the Code in this Function Validates the Decimal Fields for Errors. 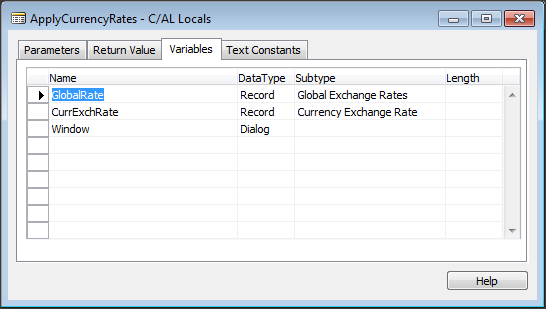 The second Part of the Function Code Sets the Status of the “Currency Action” to see if a Record Should be Inserted, “Update Rate” is for when an Existing Rate has been Found but the Input Values are Different, if no Existing Currency Rate is found the Status is set to “Insert Rate”, some Rates are Rounded to Six Places the same as the Field Properties. 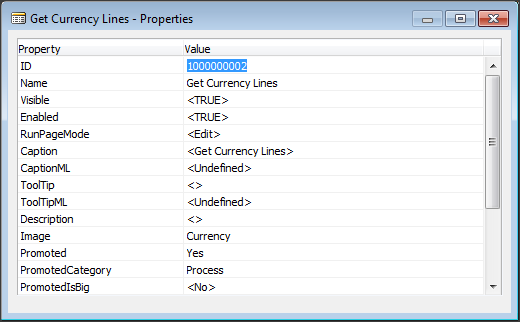 This Function Inserts the Currency Records and Sets Some Default Values for the Normal or Inverse Multiplier. 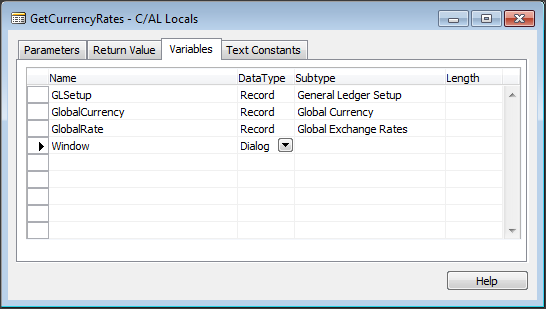 The C/AL Code Opens the Dialogue Window, Gets the General Ledger Setup and Tests for the “LCY Code”, if a Currency Record Set is found a REPEAT UNTIL LOOP is Started and the Dialogue Window is update on each Loop. 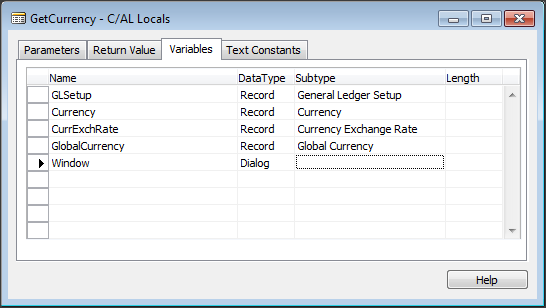 If the Global Currency Record is not Found then a New Record is Created, the Currency Exchange Rate table is Filtered to Find the Last Record and Set the Multiplier either the “Exchange Rate Amount” or the “Relational Exch. Rate Amt.”, on Insert the Type is Set. This Code Closes the above Statements. 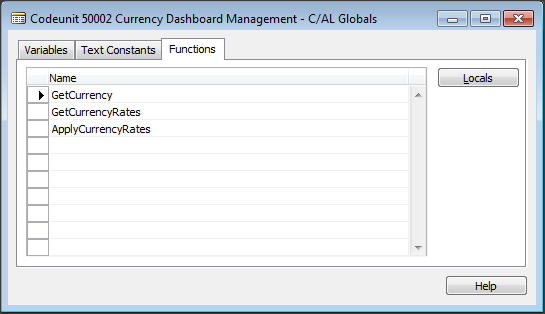 This Function Creates the Global Currency Rate Table from the System Currency Rates. 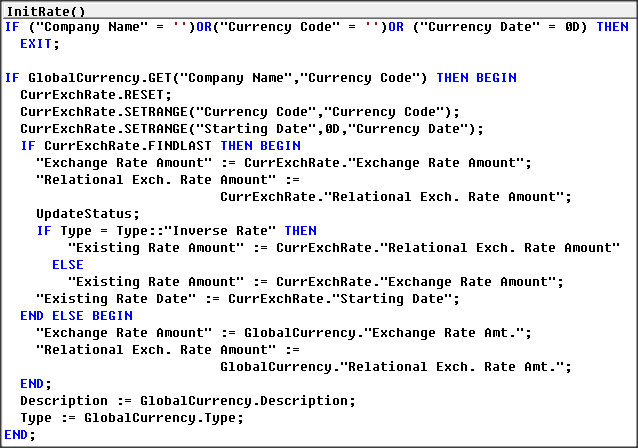 This Function is Called from a Report with the Currency Date and Populates the “Global Exchange Rates” Table, the Code finds all the Currencies, Clears the existing Data, and Opens the Dialogue Window. 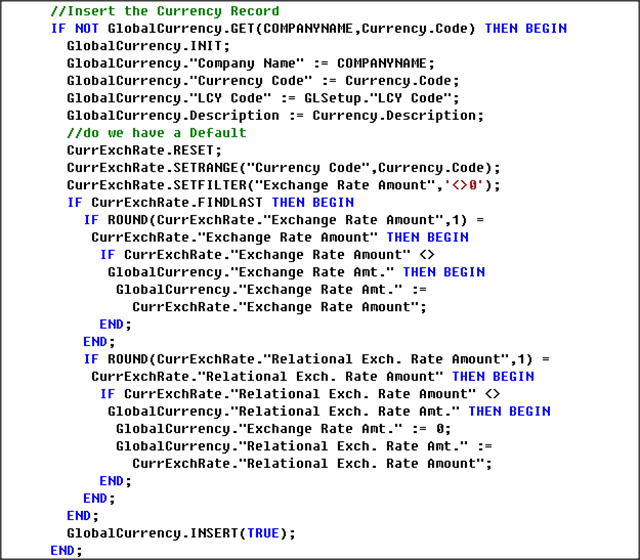 This Block of Code Checks a Date has been Passed In, filters the Global Currencies, Gets the General Ledger Setup for the LCY Code, Filters and Deletes the old Global Rates and Opens the Dialogue Window. 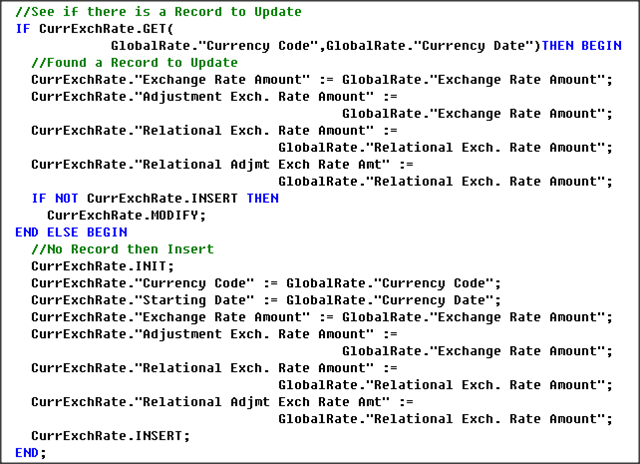 If a Record Set is found the the Global Currency rates are Inserted, the TRUE on the Insert Call runs the Table Code to Set the the “Existing Rate Amount” and “Existing Rate Date” and “Currency Action”. 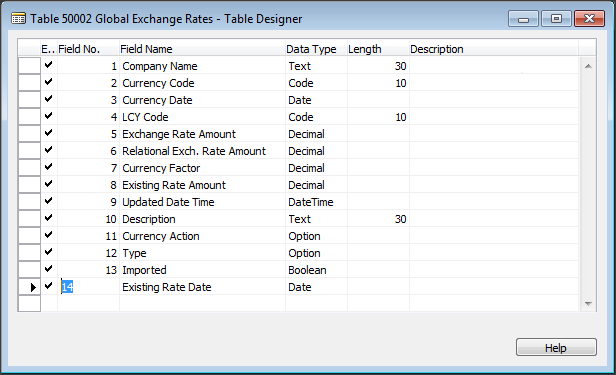 This Function Update or Inserts the “Currency Exchange Rate” Table with the Global Exchange Rate Table Values. 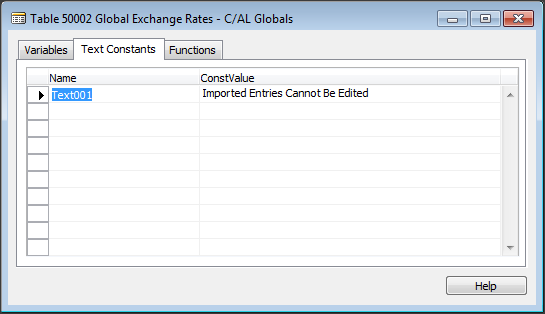 The Global Exchange Rates are Filtered by “Currency Action” for the Insert or Update, if a Record Set is found the Dialogue Window is opened. This Code tries to Get a Matching Record to Update, if it Cannot Find a Record it will Insert a New Record in the Currency Exchange Rate Table. The Existing Rate fields and Currency Action Status are Updated to Refect the Changes. 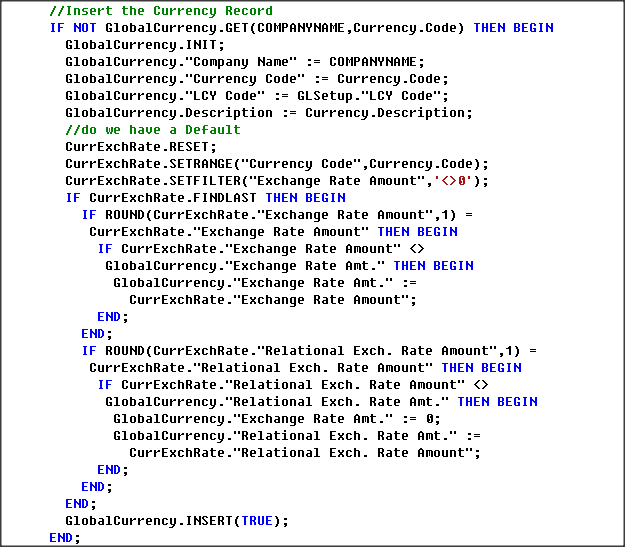 This Page is the Main Page and has Two Page Parts for Currencies and Rates. 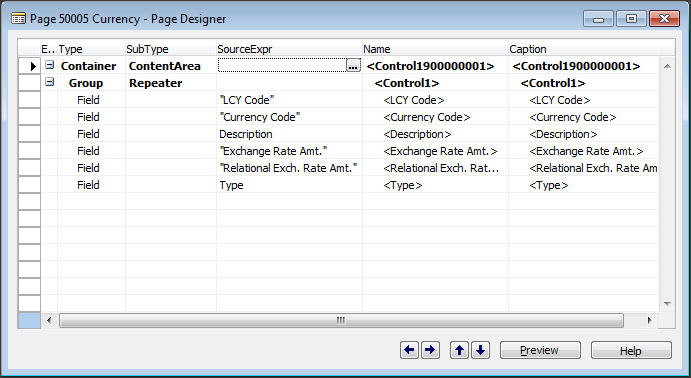 The Page has the Company Table as the Source Table, this will be used in Module 2, in this Module the Page is Filtered. The Actions are in an Action Group of Functions, the Actions Call the Codeunit Functions. Images are set on the Action Properties. 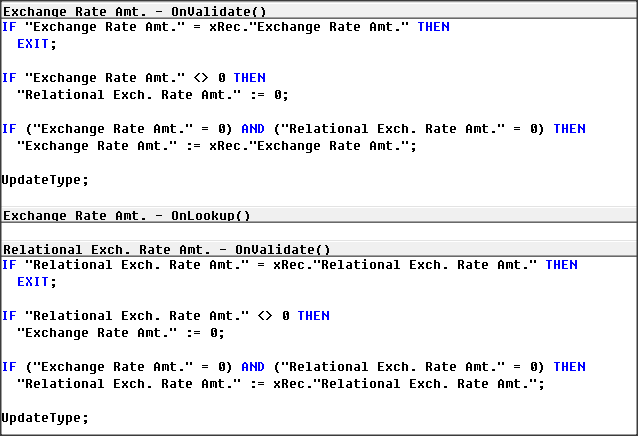 The Actions C/AL Code call the Codeunit Functions. 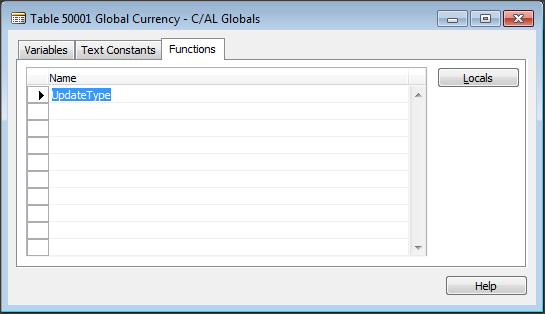 Displays the Global Currency Table in a Sub Page. 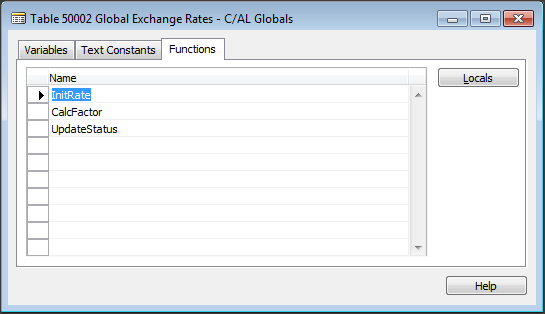 Displays the Global Exchange Rates add allows the Rate to be Adjusted. 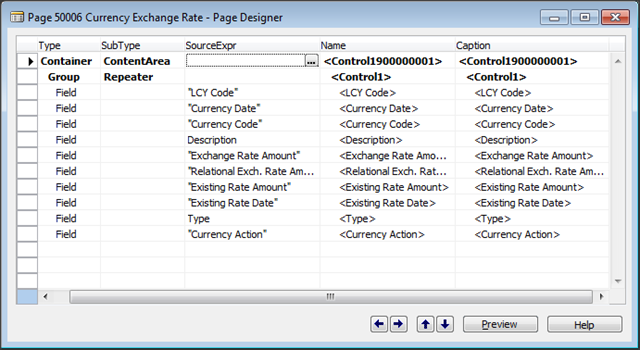 This Page has Two Page Actions to Display the System Exchange Rates and the Information Pop-up Dialogue. 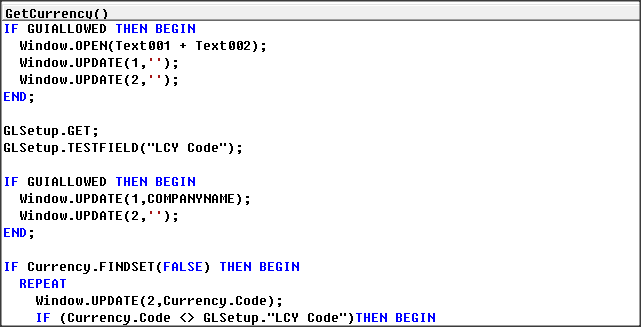 This C/AL Code displays the Dialogue Box. I hope this Post is of Use, Please take time to Comment and Feedback, I will Post Module 2 in about a Weeks Time.